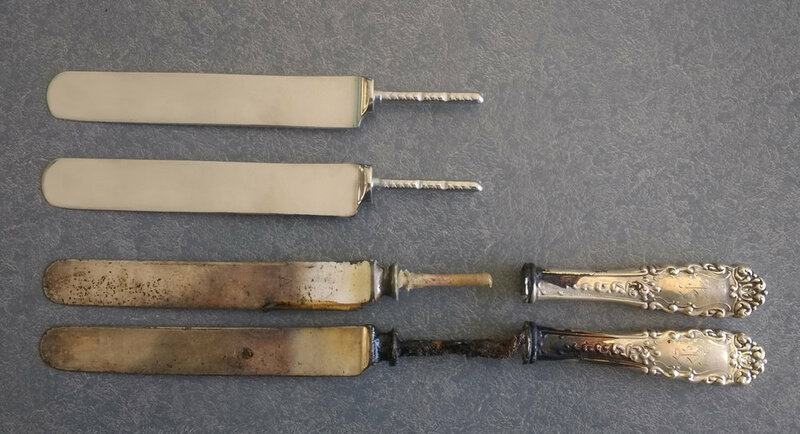 In the photo below, you can see several stages in removing the old knife blades. This is a very messy, dangerous process. It all has to be done one knife at a time. The old silver plated steel knife blades can not be replated. They must be removed, and replaced with new stainless steel blades. The photo above demonstrates the steps in taking out the old knife blades. 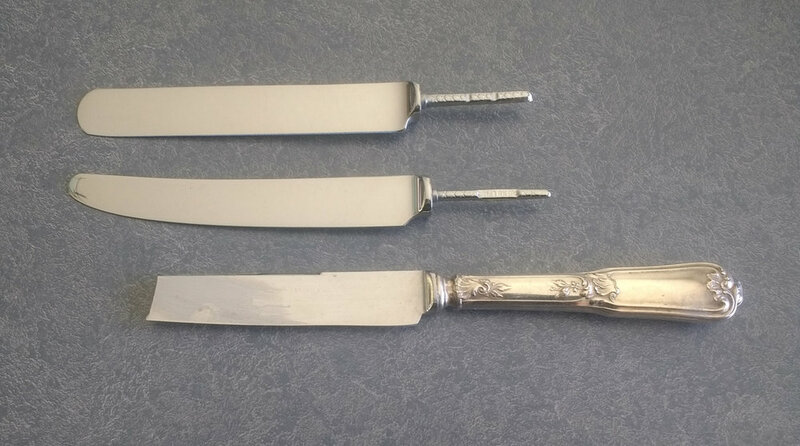 There are currently two different styles of knife blades (shown above) for replacing knives in sterling silver handles. Each style is available as both a dinner knife and luncheon knife. Contact me about having your old knife blades replaced in your sterling handles. There are a couple of knife blades styles. The new stainless steel knife blades are reset in the handles and soldered at the joint of the knife blade and sterling handle. Do not put sterling silver handled knives in the dishwasher. The heat from the dishwasher can loosen the knife blade in the sterling handle. Above photo shows an antique sterling silver handle with the original rusty knife blade and the new stainless steel replacement. Above photo shows the same sterling silver handle with a new stainless steel blade. The sterling handle was also polished carefully to preserve the intricate detail and hand engraved initial. Removing old knifes in sterling silver handles is a very dirty and messy process. The first step is to take out the old knife blades by heating the pitch in the handles. The pitch, flame and smoke makes the handles very dirty. The sterling silver handles and knife blades are cleaned and prepared to insert the new knife blades. Below you can see the same knives with the handles cleaned up and polished. All of these knives had old steel blades that had rusted and discolored over the years. The old knives were removed and replaced with new stainless steel knife blades. Did you notice that there are only eleven knives? The customer sent one knife first to see the result, and then had all 11 knife blades replaced. Click here to return to the Flatware Repair page.